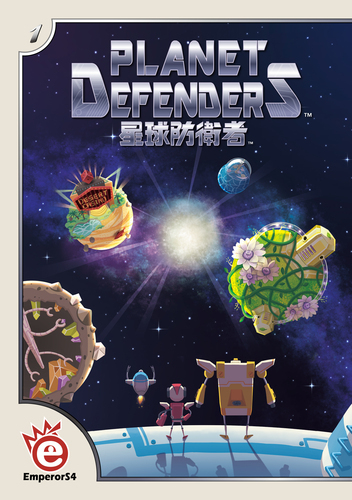 In Planet Defenders players are trying to capture wayward robots using the 3 super planet defenders robots. To do this players use actions to travel the planet system gathering resources and technology. 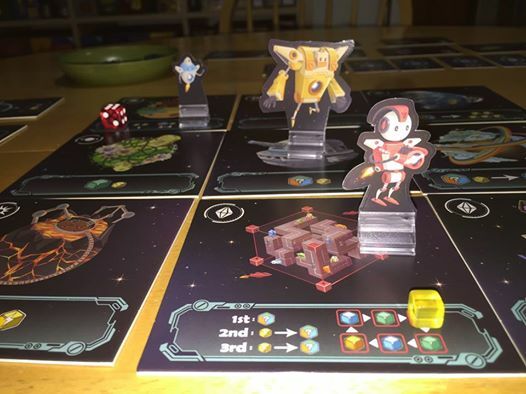 The game components include tiles, cards, 3 planet defender standees and small translucent battery cubes and larger Energy cubes. 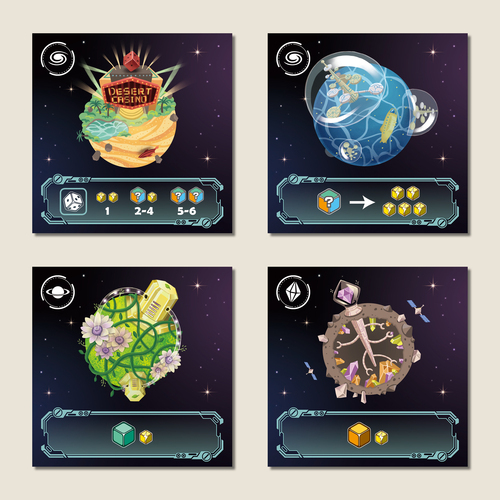 The 9 planet tiles form a modular board that the planet defenders travel on. Each planet provides a different combination of resources. The rogue robots are placed along the four edges of the board and can be captured from any of the planes along the same side. Each player starts with 5 batteries. On a turn they are allowed to do the main action once or twice and an extra action. The main action consists of paying a battery to one of 3 movement cards. This allows you to move one of the 3 planet defenders. One side of 3 movement cards allow each of the defenders to move 1 space orthogonally and the other side 2 spaces. After a card has been used it flips to the opposite side on the next turn. If the card wasn’t used it does not flip. If a second main action is done it costs 2 batteries. After movement, you can activate the planet’s ability gaining energy cubes or batteries. Following the main action each player is allowed one extra action. The first of which is purchasing a technology card with batteries or energy cubes. 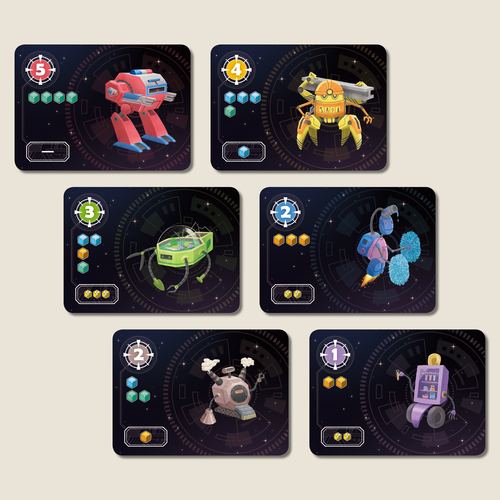 Technology cards give benefits like decreasing the cost of capturing robots or gaining extra batteries. The other extra action is capturing a robot. In order to capture a robot players must play the cost, the gain a small benefit and take the robot card. The game ends when 2 stacks of robot cards are empty. Final scoring include points on captured robots as well as points for collected tech cards and different types (color) of captured robots. The overall game play is straightforward. The logistics of the game is made more interesting by having the movement limited. The flipping of the movement cards is a clever mechanism. In addition the technology cards add some strategy to the game. You can also do a little blocking since planet defenders may not be on the same planet. The art is really cute. This is a lighter game with a short play time. I think it will work well as a filler or gateway game. This entry was posted in Essen 2016, First Impressions, Preview, Uncategorized. Bookmark the permalink.